The Germantown Employment Area Sector Plan establishes a vision that will transform Germantown’s central employment corridor into a vibrant town center with mixed-use districts surrounding the downtown. Germantown is planned to become the center of business and community life in upper Montgomery County. This Sector Plan amends about 2,400 acres of the 13,000-acre Germantown Master Plan, approved in 1989. View the approved and adopted 2009 plan (28 MB PDF). For areas outside the Sector Plan (see map, right), the 1989 Master Plan remains the guiding document. See the MARC Rail Communities Plan for changes to the plan near the train station. See also the Germantown Planning Library which contains background on the creation of this Sector Plan. Approved and adopted in October 2009, the plan covers 2,400 acres and creates a vision for mixed-use communities served by MARC commuter rail and the future Corridor Cities Transitway. New zoning tools and design guidelines will help new development and redevelopment in Germantown become walkable, sustainable, and linked to the history and cultural facilities of the community. See the progress in Germantown’s Town Center since the plan was approved in this video excerpt from our Montgomery Plans cable show. 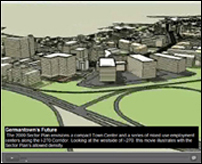 See the future Town Center in this 3-D video, which illustrates the plan density on the westside of I-270. The Town Center will be transformed from a one- and two-story place into a high-rise urban center clustered. 2010: The Sectional Map Amendment is prepared and approved in order to begin implementation of the Sector Plan. 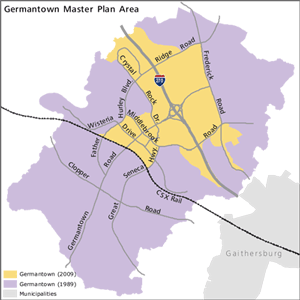 2009: The new Sector Plan, covering the area of the Germantown Master Plan near the future Corridor Cities Transitway, proposes to emphasize growth and development of Germantown’s Transit/Employment Corridor to boost the community’s economic base, enhance the Town Center, and help residents find jobs closer to home. The parts of the 1989 Plan outside of the Sector Plan boundary remain in effect. 1989: The revised Germantown Master Plan refines the vision of the town, which grew to about 35,000 residents. As common for new towns, the residential section of Germantown grew much faster than the employment portion. Thus, the originally planned residential areas of the community are nearing capacity, while the planned employment lags. Planners develop master and sector plans to create a framework for each community designed to last 15 to 20 years. The framework helps planners and policymakers – such as the Planning Board and County Council – make policy and decide on proposed development. Each plan includes an inventory of land uses and an analysis of zoning, transportation, community facilities, environmental assets, and historic structures, among many other elements. Created nearly 40 years ago, Montgomery County’s General Plan defined the land use concept “Wedges and Corridors,” a regional plan that envisioned growth corridors radiating from Washington, D.C., like the spokes of a wheel. In between each spoke, wedges of open space, farmland, and residential areas prevail. Areas served by transit – such as Germantown with the proposed Corridor Cities Transitway – provide opportunities for vibrant, compact, walkable communities.